School’s work in protecting mental health and a positive academic climate stops where the student’s responsibility starts. If America runs on Dunkin, humans run on empathy. Hoping to catalyze connections between people in order to build strong democracies through vulnerability and openmindedness. A lover of discourse, dad jokes and delicious coffee. Feeling my chest constrict around my heart, a regular vise of anxiety, I wrote in “AP Calculus AB” on my schedule request form as my friends talked about how crazy hard taking BC was going to be next year. I too had taken Precalculus Honors during my sophomore year, and I too was on the math track to take AP Calculus BC. But I’d gotten a C first semester in the affectionately nicknamed “PCH” (you ever just bubble in the Scantron on a final exam at pseudo-random, hope for the best, and still get an F?) and there was no way I could take even a B in a class my junior year. It was fine to drop to AP Calculus AB. It was right for my mental health, and I could get an A. But I couldn’t shake the feeling that those As — and my learning overall in what was considered an “easier” math class for people who “didn’t care”— would be worth less than that of my friends. 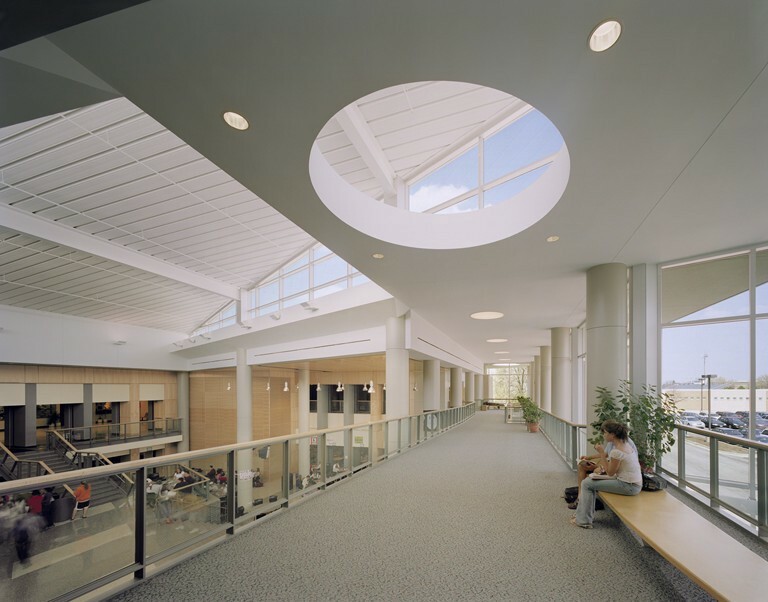 Adlai E. Stevenson High School was ranked the best public high school in the nation by Niche.com in 2017. Local property tax inflows mean Stevenson boasts an Olympic-size swimming pool, two coffee shops, and over a hundred and twenty clubs on a two-building campus of a little under 4,500 students. Endless opportunities are the norm at Stevenson, especially in an academic context. According to the College Board’s 2017–18 Student Achievement Report, nearly half of the student body took at least one AP exam last spring, with an average score of 4 on a 1–5 scale out of a total 5,606 exams. Academics are the foundation upon which Adlai’s kingdom rests. Despite Stevenson’s best efforts, though, students’ mindsets to learning often undermine the school’s attempts at sustaining a positive school climate. The Forum, part of one of Stevenson’s larger commons spaces. Take the experiences of driven, active sophomores Alex Zhou and Aditi Singh. They’ve had a year to acclimate to the Stevenson lifestyle, and they’ve chosen the motivated track of an AP student. Both are taking 7 classes that are at either the AP, honors or accelerated level, with no College Prep classes except for those required to graduate, namely Drivers’ Education and Health. When asked about their academic experiences in their regular classes versus AP and honors classes, Alex said he “definitely” valued the experience in the faster-paced classes more. He believes that even if he complains, his “academic happiness […] comes from challenge” and that these classes “satiate [his] urge to learn”. Both Aditi and Alex noted that they would find themselves “bored” in a regular level class. For both of them, the increased stress of a more rigorous class-load is a price they’re willing to pay for the deeper learning every school ought to provide under the Student Bill of Rights. Many Stevenson students accept that cost; I myself will have taken 13 AP classes by the time I graduate in May. Yet both sophomores let on that on some level, academics at Stevenson were about self-comparison, competition, and recognition by others. When asked to assess Stevenson’s academic climate overall, Alex rated it as negative despite describing his own progress as “being happy where [he] is in school”; Aditi judged it as more negative than positive. Alex has felt “extremely pressured to take the most AP classes” and said that “while Stevenson may attempt to preach” that you shouldn’t compare yourself to others, students still definitely take on that mindset. The sheer number of high-achieving students makes it hard to place a value on an accomplishment, whether that’s getting an A in one AP class or seven. Alex nonetheless noted that this kind of pressure was “leveraged” by many kids at Stevenson to make them very successful, and that having a quantitative comparison to others almost lent him a sense of purpose. When competition drives success in this manner, it adds a fascinating layer of dimension to Stevenson’s motto: Success for Every Student. Through Alex and Aditi’s eyes, success appears to be a limited resource rather than a public good. If academics lend themselves to competition, is Success for Every student really possible? Senior Josh Ezrol implies that it is. He characterized Stevenson’s academic climate as more positive than negative, telling me that we tend to “overthink the negative aspects”. He’s taken a few less AP and honors classes than his peers, dropping from Precalculus Honors to Accelerated and exploring normally paced electives like Constitutional Law. He echoed Alex and Aditi’s thoughts on being “bored out of [his] mind” in some College Prep classes, but he felt that the academic experience in a class was very course-specific and that it was the task of the teacher to engage a student, not the rigor of the class. Class counterpart Dora Guo is also an AP heavy student outside of her dance electives, and she felt that positivity in Stevenson’s academic setting was intrinsic. She managed the rigor of her classes by reenergizing with her dance community and “3-dimensional” groups of friends that didn’t spend all of their time hashing out their grades that she could take back to her academics. For her, reducing competitiveness in her classes was about the people, not the school. The diversity of student experiences in Stevenson’s world of academia is even more interested considering the focus on maintaining the positive, vibrant aspects of student life. Outside of fully staffed Student Support Teams of counselors, social workers and school psychologists available to students, The Freshman Mentor Program or FMP is a big one. For half of their lunch period, freshmen spend two semesters developing bonds with the other students in their advisory period while learning about the school and doing activities with three to four upperclassmen mentor. From simple social-emotional learning activities like name games to a Signs of Suicide program to counselor talks on scheduling and GPA waivers make FMP an integral part of the transitioning process to high school. As a mentor myself, I feel that more and more it may be an imperative of the FMP program to combat or reframe the way kids think about academics and how they compare to one another. Alex, Aditi, Josh and Dora all noted that participating in FMP their freshman year may have helped them adjust socially or represented a brain break from their day, but didn’t really contribute to learning how to cope with stress and thrive academically in high school. Outside of the work of faculty, clubs like OneStevenson and Peer Helpers are meant to help the student body feel unified and de-stressed. Despite Peer Helpers hosting a Kindness Week with laminated cards, they can’t seem to make a dent on the overwhelming stress students feel being in a rigorous academic environment. The College Career Center hosts a hot chocolate station during first semester finals, brings in puppies for a Destress Wednesday, and bought squishy toys for every student during AP exams season last year. All these efforts to marry deeper learning and a positive school climate seem to have no effect on the phenomenon of students continuing to have polarized experiences with stress. It seems that it’s on the individual student to be attracted to the Stevenson experience one way or another, and take advantages of the resources the school provides to handle stress and protect one’s mental health. Any competitive, rigorous public high school will struggle with keeping students sane and making sure students value their work across classes, and the school’s work in protecting mental health and a positive academic climate stops where the student’s responsibility starts.